The West Texas desert is familiar territory to all manner of bandits, desperados, Indian raiders…and a serial killer! The gruesome murders of young women by a savage predator, known only as the Fort Davis Butcher, puts famed outlaw hunter Johnny Madrid on his trail. Madrid, a former Texas Ranger and now a deputy U.S. marshal, must decipher the evidence leading to some shocking conclusions. 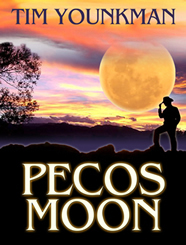 In his latest novel, “Pecos Moon,” veteran crime writer Tim Younkman introduces Madrid, whose exploits include a shootout with legendary Texas train robber and killer Sam Bass, ending the bandit’s career…and his life. The investigation leads Madrid across the vast expanse of Texas where he corners the Butcher and then discovers another, even more diabolical killer described in the press as the “Servant Girl Annihilator.” This new killer has been loosed on the state capital, bludgeoning his way through the upscale neighborhoods of Austin, leaving mutilated women in his wake. When his own family is threatened, Madrid discovers the link between the Butcher and the Annihilator leading to a final highly personal and most deadly confrontation. Johnny Madrid is a rare breed of tough Western lawman, a mixture of European Spanish, Bayou Cajun, and Mexican heritage, who fashioned a legend and legacy across the burgeoning frontier, an enforcer of the law who knows how to bend it to achieve justice, and definitely a man one cannot forget. In “Pecos Moon,” Younkman captures the elements that drew men and their women to the desert plains of West Texas as they forged a promising new world from their dust-coated past. It was on a Tuesday in 1929 when the stock market crashed, a day of importance to Detroit police detective Patrick Quinn because it was the day he died, shot by gangsters in a downtown skyscraper. At the very moment he should have been dead, he finds himself in police headquarters outside the detective squad room, but 84 years in the future. Quinn finds himself in a strange new world that somehow is unsettlingly familiar—it’s the same town, same streets for the most part, same job—but different. There are women police officers, black police officers, telephones you carryt in your pocket, miniature motion picture screens on top of each desk. There are men with earrings and women with tattoos. He ends up with a new partner, former pro football player Wilson Dexter, who gradually becomes convinced Quinn is telling the truth, that he was a cop back during Prohibition and was gunned down in the line of duty. Together they have to solve a series of new murders that somehow feels familiar to Quinn, and they decide to solve the mystery of who arranged the murder of Patrick Quinn in 1929. Quinn finds himself helped along the way by an attractive and daring female EMT. Veteran crime reporter Tim Younkman weaves a story of murder and intrigue in two crime-riddled eras on the same streets separated by nearly a century. The protagonist Patrick Quinn must solve not only a new set of murders but must face the dilemma of deciding if he must return to 1929 to solve his own. 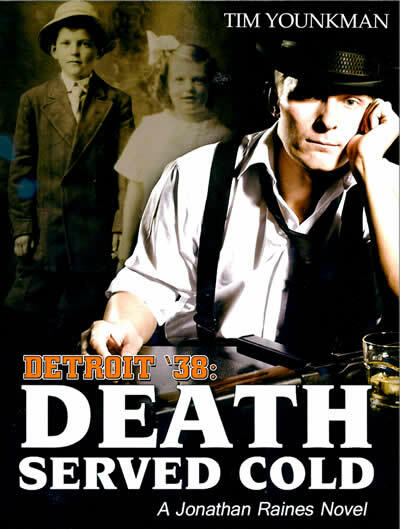 Detroit ‘32 is the turf of private detective Jonathan Raines, an ex-Marine and war veteran who must unmask the killer of a prominent auto executive’s party-girl wife, murdered in the penthouse of a gem dealer on the 32nd floor of the swanky Book-Cadillac Hotel. 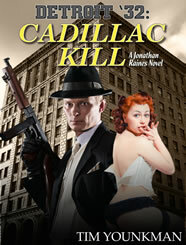 While navigating the murky underworld of the Purple Gang, Italian mob, and crooked cops, Raines’ top suspect is the beautiful victim’s husband, Hudson Motor Co. exec William Ponder, son of Willis Ponder, the company’s chief officer. Prohibition and the Great Depression merge in the once-booming metropolis creating a dangerous environment as Raines’ expands his investigation to include Edsel Ford and his famous industrialist father, Henry, along with his ruthless Ford henchman Harry Bennett. 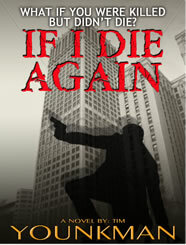 At every step, Raines finds himself the target of someone who wants the investigation stopped. Armed with his .32 caliber Colt hammerless automatic he fends off a series of attacks, dispatching an ever increasing number of gunmen onto slabs in the Wayne County Morgue. The mystery is unraveled with a gathering of suspects in the glitzy Graystone Ballroom with a shocking and unexpected conclusion. While Prohibition has waned, the Depression continues to plague the city, and his hometown contacts become vital as Raines returns with a new case in which children of Ford auto plant workers are kidnapped and ransom is demanded from Ford magnate Edsel Ford. Raines uncovers a diabolical plot to kidnap and kill Ford’s own youngsters and chases the kidnappers from Detroit to Maine and what he finds is even more distressing. Can he solve the case without getting everyone around him murdered? 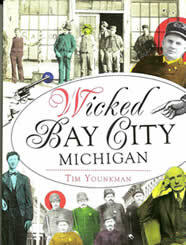 In my new book, “Wicked Bay City Michigan,” explore Bay City’s red light district, descriptively known as Hell’s Half Mile, at the peak of the lucrative lumber industry with thousands of lumberjacks descended on the town for liquor, entertainment, gambling, and other vices. Then learn about the Polish War, a unique chapter in American history in which two warring factions of Polish immigrants battle for physical possession of the beautiful St. Stanislaus Catholic Church and school. With shootings, stabbings, beatings, and attempts at lynching, the fabric of the Catholic community is tested to the breaking point. Intervention by Pope Leo XIII eventually results in a truth, but ill-will among communicants continues to this day. Other stories describe how the death of an 11-year-old boy employed on construction of the new City Hall lead to a new child labor law, and take a look at the dangerous jobs and unimaginable working conditions endured by youngsters from coal mines to the sawmills. The book also deals with the murder of a lumber baron, the shooting death of a policeman, and the rise of a hoodlum gang during Prohibition in Bay City’s South End. There is a story on the biggest strike to hit the Saginaw Valley and on how a prominent Bay City businessman and publisher lead a double life. It’s all here in one book and one that would make an excellent gift. The book is available at the Bay County Historical Museum shop, and Barnes and Noble bookstores, plus online at amazon.com and barnesandnoble.com, plus other booksellers, and is available in digital form as e-books. Order one now.